Google understands that what drives its business is advertising. For years they have worked diligently to do all they can so that businesses may get a return on their investment when they use their AdWords service. AdWords, as SEO/SEM professionals already know, focuses on keywords. So it's no wonder that Google has continually added improvements to AdWords making it not only easier to use, but more effective. 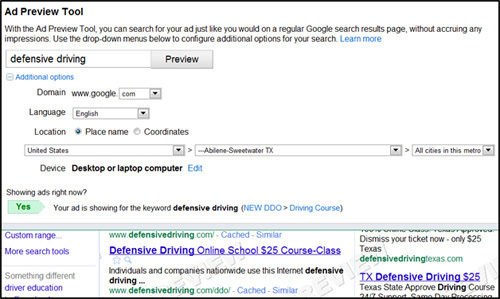 Recently Google has offered a new and improved Ad Preview Tool. Continue reading to find out what's new and how SEO/SEM professionals can effectively utilize this tool? What's New with the Ad Preview Tool? In addition, Google states that the Ad Preview Tool makes it a great way to check how your ads that you create for syndication appear - without the issue of racking up addition impressions or clicks. In addition to it being easy to navigate and view, you probably have seen in the above image the radio buttons and drop down menu for Location or coordinates. Yes, one of the most functional ways to use this tool is to view how a possible ad let’s say for example in Los Angeles, will look to a user there - even when you, the administrator, is located on the East Coast. Another feature to mention is the integrated keyword diagnosis. 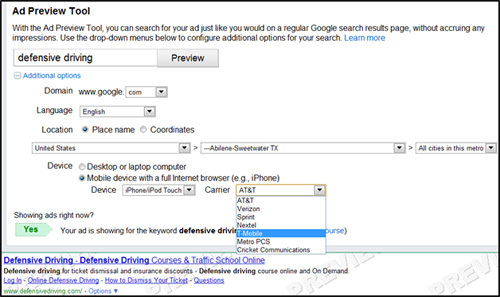 Simply by logging into your AdWords account and previewing your ads, you will see this feature. For instance, in the above image, if the keyword "red roses" was inserted in the Preview field: At the bottom of the box you may see at the left the green box that says "Yes, your ad is showing for the keyword red roses". This obviously makes keeping track of your ads more convenient. For those ads that are not showing up, the tool will be able to tell you why. This way, you can make adjustments such as increasing a bid amount, location targeting, changing your daily budget, etc. Also to note, this new tool offers a device setting, which is helpful for those that want to view or diagnose ads for a mobile campaign (smartphones). As you can see in the image above, there are many carriers which you can have campaigns for and this tool helps you view info about your ads instantly. It's also useful for those who create ad campaigns to run in regions other than where they are geographically located. For example - if you have an ad campaign running in Florida and you are located in New York, this tool can be extremely valuable. Obviously, this preview tool is an invaluable addition for those who run PPC campaigns. My advice is to definitely check this tool out and see how it can help your business. In addition, for those who may be thinking about incorporating a mobile ad campaign, this tool definitely gives you beneficial insight into not only how your ads will look, but more importantly, a way and means by which you can manage a mobile campaign effectively. As always, we'll keep you updated on additional tools that Google periodically makes available. Find out more and use the tool yourself by visiting the following url: www.google.com/adpreview.